First of all I need to tell you guys that I absolutely love anything related to NASA and missions in space. This has alot to do with the fact that in the years before my grandfather died most of our conversations went around the current mars mission and listening to NPR together to get all the current updates. My grandfather was fascinated and his excitement was nearly impossible not to wear off on you. Plus I grew up on National Geographic and documentaries. While most kids watched cartoons I couldn't keep my eyes off any sort of learning or nature show. With that said the release of some of the most breath taking nature and earth dvds in the last few years have had me in total awe and practically drooling on the cases. Though the IMAX Hubble release hasn't gotten as much press as some of the other dvds that have come out in the past year or two it should not be ignored and images alone makes me really wish I would have caught this one in all of its IMAX glory in the theater. The documentary follows the 2009 crew that was sent to rescue the Hubble Space Telescope. You follow the crew of the Space Shuttle Atlantis as they set out to rescue the oldest and very well known telescope. It takes five space walks and a pretty risky maneuver with a mechanical arm to fix the Hubble but the images and video captured during the mission is breathtaking to say the least. I wish they would make more such documentaries as I really think if people payed even a little bit of attention to the space program they would be as fascinated. Maybe a little more recognition and more people would realize just how important our space program and NASA truly is. I can't say enough great things about IMAX Hubble and regardless if you have kids or you just want to watch something that will take your breath away it's an awesome video and I promise you will want to watch it more than once. 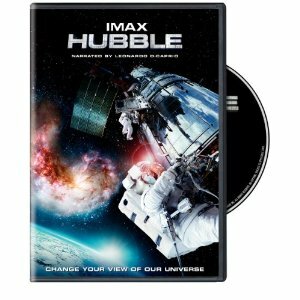 IMAX Hubble is available on dvd and you can pick up your copy at Amazon ! Disclosure: We were given a copy of IMAX Hubble free of charge, we were not compensated for this post in any other way. My opinions and comments on items we review are always my own and are never influenced by sponsors!